How much of your income do you spend on your rent? The answer probably depends on where you live. Rents can vary wildly from country to country, city to city and even within regions. While it probably won’t be news that people living in cities generally spend a higher proportion of their income on rent, new research directly links rent affordability to homelessness and highlights the lack of consistent data on the topic. When rent affordability exceeds the 32% tipping point, homelessness rises rapidly. 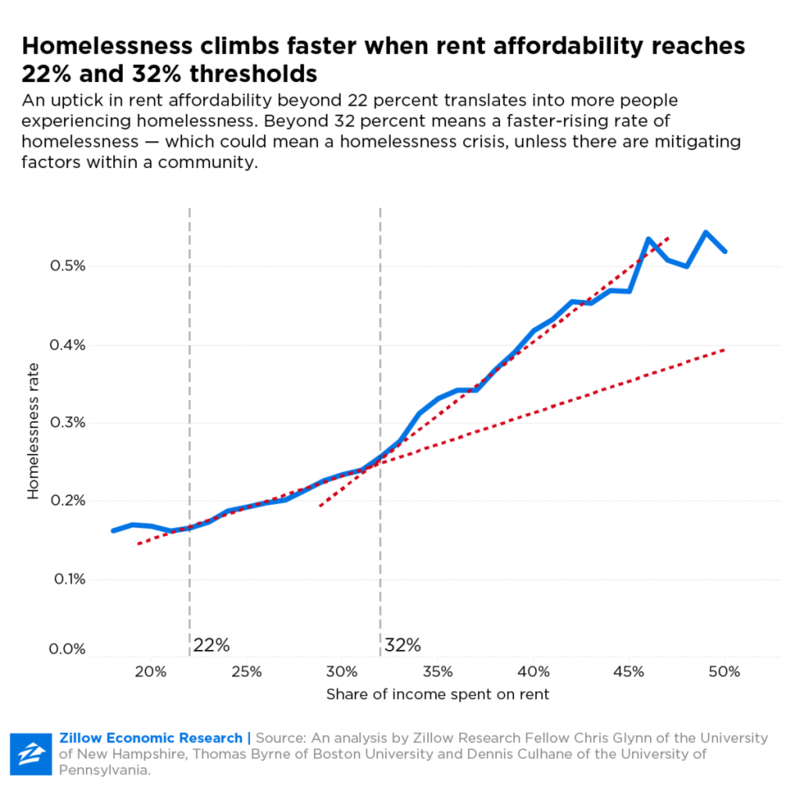 The critical threshold is 32%, with the report showing that American communities where people spend more than that percentage of their income on their rent can expect a more rapid increase in homelessness. The academics, working with online real-estate company Zillow, also estimate that the scale of homelessness in the US has been undercounted by around 20%. While the work underscores the idea that there's no one-size-fits-all approach when it comes to tackling homelessness, it does offer policymakers a way to quantify and anticipate when dynamics may be shifting. Since the median US rental takes 28% of earnings, monitoring how the levels are evolving could help to flag up looming problems. Seattle and San Francisco are both facing an affordable housing crisis. Around 150 million people, or about 2% of the world’s population, are homeless, according to Yale University, and a further 1.6 billion, more than 20%, may lack adequate housing. Since obtaining accurate numbers is difficult, primarily because of variations in the way homelessness is defined, the numbers could be higher. The Zillow academics estimated the true level of homelessness in the US was 20% greater than the official count, and said there was wide variation across the country. In Los Angeles and San Francisco rent affordability has been well beyond the “crucial benchmark” of 32% of income for decades. While this research focused on the US, homelessness is a problem for every country. Tenants in England paid an average of 27% of their gross salary to their landlord in 2016, according to data from the Office for National Statistics. That data also shows regional variation, with tenants in London spending nearly half of their salary on rent, while in northern England, the number was much lower at 23%. The homelessness rate varies by country. Drawing international comparisons can be challenging because of the different ways it is measured. Among OECD countries, Australia, the Czech Republic and New Zealand report a relatively high level of homelessness, but this is partly explained by the fact that they have a broad definition. In Australia people are considered homeless if they have “no other options to acquire safe and secure housing, are without shelter, in temporary accommodation, sharing accommodation with a household or living in uninhabitable housing”. Homelessness is a problem in every country. 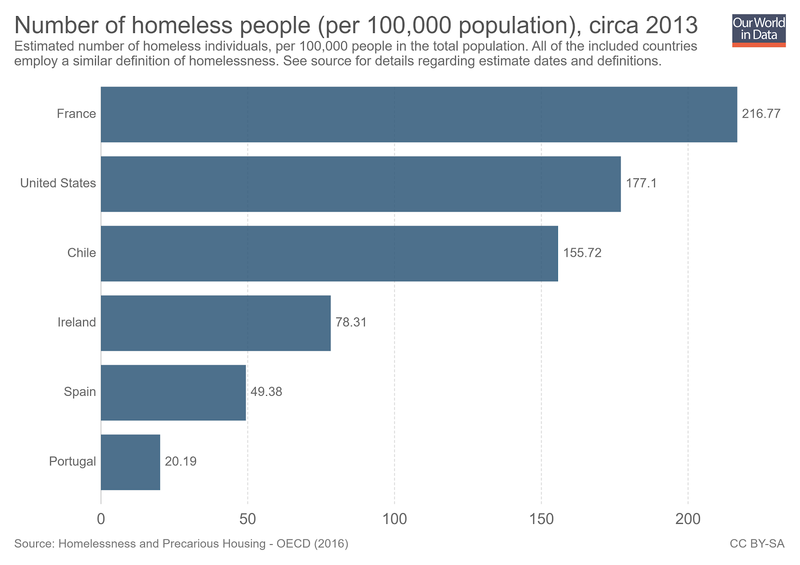 In contrast, the OECD country with the smallest share of homeless people is Japan – 0.004% of the population in 2015 – where figures only refer to rough sleepers. For policymakers around the world, solving the challenge might mean rethinking ways we live and work or using technology to improve transit. With the UN predicting that 68% of the global population will live in cities by 2050, innovation and technology can be harnessed to this end, and that’s one of the areas being explored by the World Economic Forum’s Global Future Council on Cities and Urbanization.